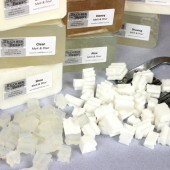 If you make cold process soap, there’s a good chance you’ve gotten soda ash. It creates an uneven, white, ashy film on the bars. Soda ash is harmless, but it can be frustrating. Learn how to prevent it in this post. Soda ash forms when unsaponified lye reacts with naturally-occurring carbon dioxide in the air. It doesn’t affect the final bars and the soap is safe to use. However, it can obscure more intricate designs. It typically shows up on top of soap, but in some cases it can run all the way through. 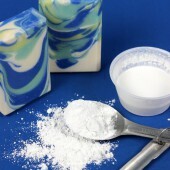 Soda ash can also make the soap feel crumbly. It usually forms within 1-3 days. 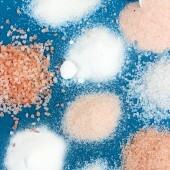 This is an example of deep soda ash – notice the crumbly texture. Soda ash most often forms with lower temperatures and when the soap is poured at thin trace. 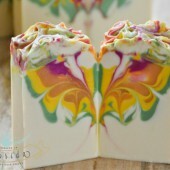 You may notice it more with swirl designs that require thin soap. To help prevent it, make sure your lye and oils are 100°F or higher. We like to soap around 115-120°F. 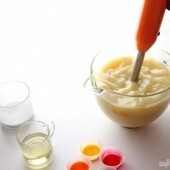 Then, pour the soap when it’s closer to medium trace. Spray the top with 99% isopropyl alcohol right away, then again in 10-15 minutes. That helps create a protective barrier. Finally, cover the soap with a piece of cardboard and a then towel or blanket. That keeps the soap warm and forces gel phase. If your house is cold, you may also want to place the mold on a heating pad set to medium for 30-60 minutes. Then, turn the heating pad off and leave the soap on it for 24 hours. 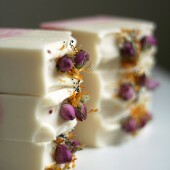 Learn more about how to insulate soap here. If your design requires a thin trace or if the steps above aren’t working, there are other options. A water discount really helps. Not only does it prevent soda ash and glycerin rivers, but it helps the soap unmold and cure more quickly. A 5-10% water discount is a good place to start. You can also try reducing the superfat to 2-4%. Adding 0.5% melted beeswax at thin trace is another option. It creates a barrier between the unsaponified lye and the air. It also helps harden the bars and gives them a slightly shiny appearance. Keep in mind, working with beeswax is an advanced technique. 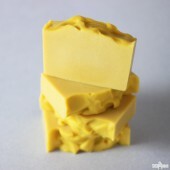 The lye and oils need to be around 160°F to keep the beeswax melted, and it will speed up trace. Even with preventative measures, soda ash can still form. You can clean it off with the following methods. 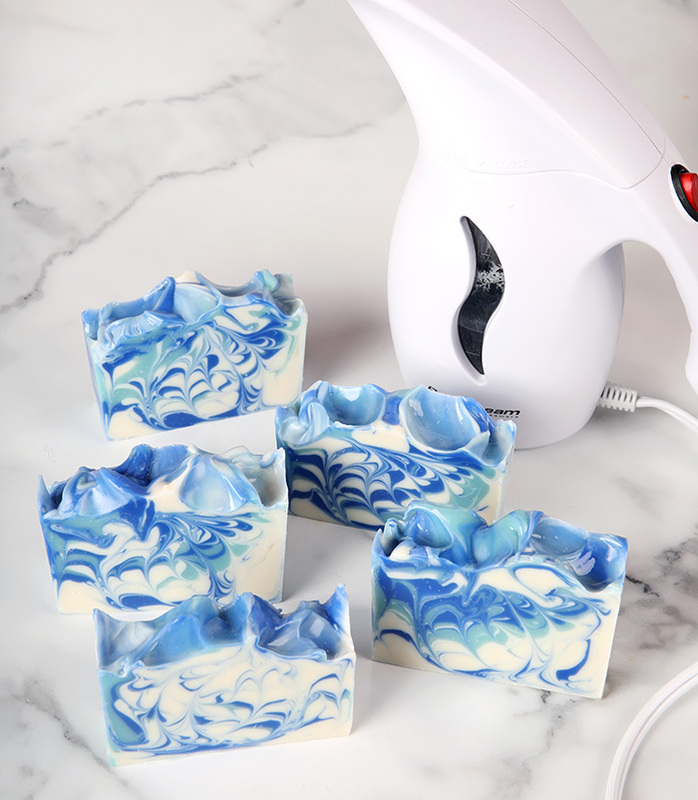 If you make a lot of soap, we recommend investing in a handheld steamer. 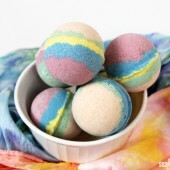 It gets rid of the soda ash quickly. 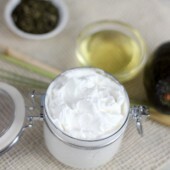 Hold the steamer about 1-5 inches above each bar of soap for 20-30 seconds. Once the bars are dry, they will be clean and shiny. This method works best for a light layer of soda ash on top of bars. You can also give the bars a cold water wash. Make sure you’re wearing gloves so you don’t leave fingerprints on the bars. Run the soap under cold water and scrub the areas that have soda ash with a paper towel. Once it’s gone, rinse off any lather and let the bar dry. Another method is scrubbing the bars with old nylons. Once you can’t wear them anymore, cut the foot off and use it the same way as the paper towel. You can reuse the nylon – just rinse it off and hang to dry in between uses. 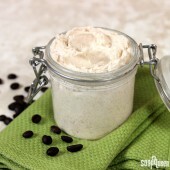 You can also use a Soap Shaver to remove the top layer of soda ash. In the photo below, the bars on the left have been run over the shaver. Not only did it remove soda ash, but it created a nice even top as well. I have tried all the tips and tricks I’ve found. I hate gelling my soaps so I have to soap lower. After 8 months I’m still fighting partial gel and thick soda ash. When I started out it was just a thin layer. Now it’s super thick. I always spray with alcohol multiple times and it never works. I used to wash it off but my ones with glitter on them, it washes it away. 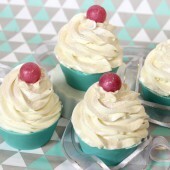 I just started making soap cupcakes but I can only make them with white frosting because of this problem. I don’t know what to try. I don’t know what’s more annoying the partial gel or the soda ash. 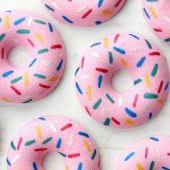 I also recently started piping on my soaps and it increases the partial gel more than my ones without piping and it overheats a lot even though I’m soaping at room temperature, I’ve also tried your tips on preventing gel article. I am really confused as to why this keeps happening. That’s tricky. The only way I can see around it is either washing the soda ash off and using less glitter for your tops or trying to sprinkle a little glitter afterwards. 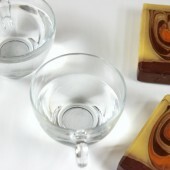 Or if you want to try gelling your soap that would help as well. The one thing that I learned early is a steamer can really help with ash and brighten color. Leaving it in the mold for at least 24 to 36 hours helps and keeping it warm and covered. Following all the preventive techniques is #1 and using the steamer is very helpful. I also heard that using a small amount of bees wax can help. Thank you BB for all the informative articles…very helpful. I am using a cold press goat milk soap recipe and I keep getting soda ash heavily threw the bar and it makes it hard and crumbly looking. I normally wait till 100-110 degrees and then once I pour I put the alcohol on top and put in the freezer for about 2 hours and then unmold and let it sit in the fridge for about 6-8 hours then I cut. I keep getting the dark circle in the middle as well which I read was gelling. Should I not be using the freezer and force gel phase instead? That is gel phase that you’re encountering, and you may want to leave your soap in the freezer for longer than 2 hours to make sure that internal temperature stays low and stops gel phase from happening. Or you can try forcing gel phase if you’d rather your bar have that look to it. Ultimately it will be up to you, whichever method you prefer best. 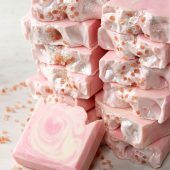 I am wondering if I could use the milk soap technique with a regular cold process soap recipe. I always want to make soap with my young child but hesitate because of the hot temperature of both the oil and the lye solution. I used coconut oil, palm oil, olive oil, sweet almond oil and avocado oil. I used the plain water ice cube instead of room temperature water when I mixed with the lye. It resulted without any steam, less fume and the lye solution is always cool. When I combined the oil and the lye solution, the temperature is around 80F. I got the soap without any false trace or soda ash. It had to stay in the mold for at least two weeks before unmolding it. I am not planning to make any fancy soap with this technique. Can you tell me if this is feasible? Thank you! We don’t recommend ‘soaping cold’ because of the myriad issues it can cause. If you’re happy with the results though, there’s no reason not to continue doing it that way. Just be sure to keep that little one safe. What is “soaping cold”? And, What issues….can you elaborate? but sorry if my question is not relate with soda ash. i got my new batch of soap yesterday, but it trace sooooo quickly and i didn’t have time to even mixing the colorant and fragrance. can you see if any of my recipe was wrong? or is it only caused by the water discount? and also, i pour my lye solution right after i mixed it with water. and then i read your article that we have to wait until it colling down under 130 degress. 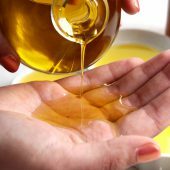 when exactly the best degress to pour lye solution to oils? The water discount would be the main reason your soap accelerated so quickly. 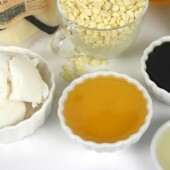 The exact temperature to soap with will depend on your specific recipe though I normally soap at about 110-120 degrees. 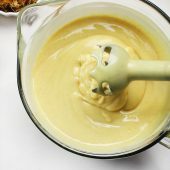 You can make a recipe with the sunflower like that though it would be a pretty soft recipe with that higher percent of soft oils and combined with the lower percent of Palm / Coconut. i have one more question, is it true that we have to cook the palm oil before we use it? for how long? and when the best time to mixed it with another oils? No, you just need to make sure the Palm oil is fully melted before separating it from the container and adding it to your oils. 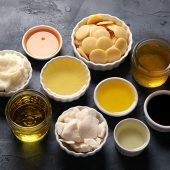 Otherwise the good fatty acids in the Palm Oil can be left at the bottom of your container instead of in your products. 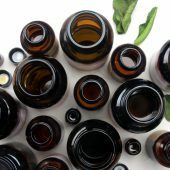 I have discovered that if I spray the tops of my soaps with my alcohol a couple of times a day for a few days during cure, that it has a very good affect on the soda ash. The ash starts to fade during that time, sometimes to the point that it has completely disappeared. I am so glad you explained the cause of soda ash. No one has ever believed me when I tell them it is lye interacting with the carbon dioxide in the air. But I guarantee they will believe it coming from Soap Queen! 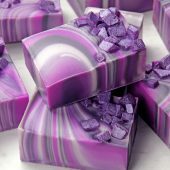 I make soap every week and I never have soda ash thanks to soapqueen.com The rubbing alcohol trick works every time. 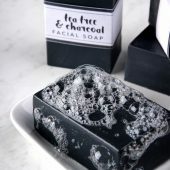 With a very thin soap, I let it firm up a few minutes to have a surface to adhere to, but I always give it a generous amount and another one in about 5 minutes and it works every time. This is not necessary with hot process soap so I don’t do it then. 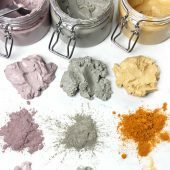 Thanks for saving hundreds of batches from soda ash, soapqueen.com! I have a question about the gel phase. I had a soap that I didn’t insulate, but it overheated anyway. My soaping temp was about 120-130 max. The result was a soap that half was somewhat crumbly, and as I cut it, the bottoms broke off in an odd texture. I superfatted at 5% so not lye heavy. My question is would this happen if I gelled my soap? Gelling or not gelling your soap does not normally affect the crumbliness. That is usually due to too much hard oils, clay or lye heaviness. 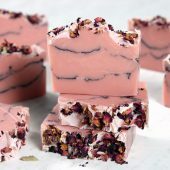 If you are not wanting to insulate your soap and you are worried the recipe will overheat (this is common for milk soaps and other additives that contain sugar, like purees) then you can put your soap in the freezer instead to help prevent it from overheating and cracking. I don’t generally have a lot of problems with ash with my loaf molds, usually if I get it, it seems to happen in corners of the mold. And there are some fragrances that always turn ashy no matter my recipe. 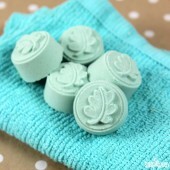 But I always have excessive ash anytime I use the individual soap molds, like the square and round 12 cavity molds. I’ve never had any luck trying to steam it away. The only way I’ve found to remove it is to shave it off or to wash my soap under running water with a washcloth, then let it dry. Kelsey, thanks for your help in troubleshooting the problem that I was having with my soap. 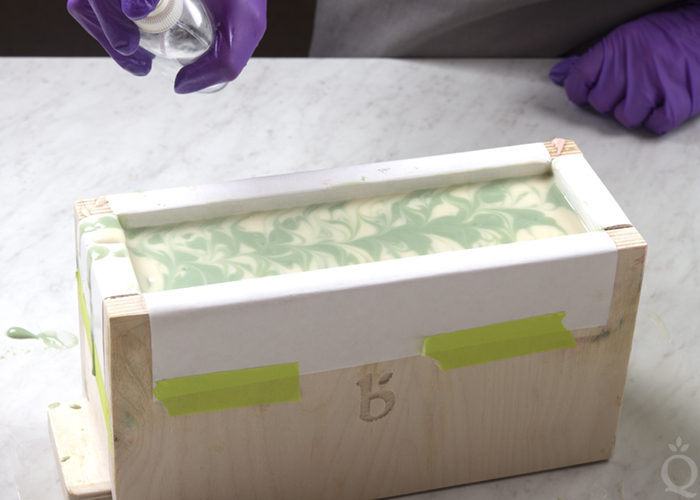 There is so much to learn about making soap. 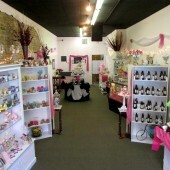 And, Soap Queen is a great place to start learning and understanding the process of soapmaking. 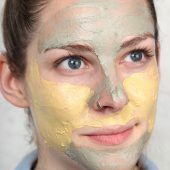 This website is full of great information, especially for a newbie like me. Please help. I am not sure that mine has soda ash. After 24 hours, I unmolded the soap and there were some white pebbles or maybe lye crystals on the top of the soap loaf. I knew that there would be a disaster because I was having problems with my thermometer and I believe my lye water was too hot. Could this have cause the crystals on top? Also, do I need to throw away the wooden soap mold? Waw! Really interesting post! I didn’t know what is soda ash but now after I read about it I realize that I’ve seen it so many times! Thanks so much for the tips! 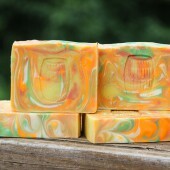 I would love to have my soaps looking cleaner! Greetings! I’ve been soaping for a while and everything used to turn up roses every time, however, over the last year some interesting issues keep arising. The most annoying and consistent being every batch of soap I’ve made in the last year almost froths as soon as I turn on the stick blender. I’m mixing the lye water and oils at about 110 degrees, pouring the lye water slowly over the shaft of tgd blender, burping the blender to remove the large air bubbles. Every time I turn on the hand mixer a giant froth of bubbles errupts and it’s impossible to get them out. Have you ever experienced such a thing?! Thank you so much for all of your wisdom. Oh no, I’m sorry to hear that! I’m wondering if it’s your stick blender. Sometimes, after a lot of use, stick blenders can start malfunctioning. I’m thinking the tool is whipping extra air into your soap. 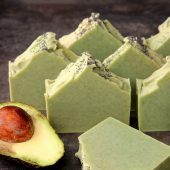 Hi, could you please tell me if there some way to insulate the soap if I added some texture and I can’t wrap it in towels and I don’t have any cardboard at hand? I just made a batch and the texture thing was a last minute decision. I didn’t know what to do, so I put the mold in the freezer, like I’ve done when I make CP with Milk to prevent scorching. Then, you can wrap it with anything like a blanket, a towel, bed sheets. Anything that will help keep that soap warm! thank you Kelsey !! I’ve just read what you posted about gel phase and now everything is clear to me. But before I read your post, I took the soap out of the freezer (after aprox. 18 hours) and left it on the counter. I checked a couple of hours afterwards and the mold was sitting in a pool of water, and there was some also water on the texture part of the soap. I didn’t notice the water at first, until I moved the mold, and I got some of this water on my bare hand. Maybe I was a little paranoid, but I felt like it was burning so I went and washed my hands with lots of water. -Everything is well. 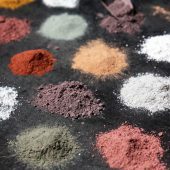 The recipe I made was one you posted with natural colorants (annatto seeds, alkanet root and spirulina), and it looks like the colors are not so vibrant. I believe it was because it didn’t go through gel phase, as I understand now. I haven’t been able to unmold because it’s all mushy, so I’ll give it another day or two before I try again. 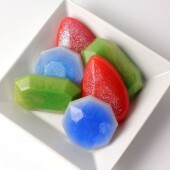 I think I will try again this recipe allowing the soap to gel, and see the difference in the colors of the final soap. Also, when you take your soap out of the freezer, it can form little beads of moisture. It’s the same thing that happens when you defrost food! I’m wondering if that’s what the pool of water was. The great news is that water will evaporate as the soap sits and room temperature! As an added bonus, after giving your soaps a quick dip in distilled water and drying with a heat gun, I notice the fragrance perks up as well! 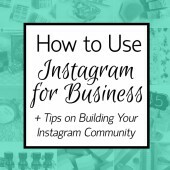 I love reading all the tips and tricks people have found works for them. Always learn something new when I do that! Thanks everyone! Ok, here’s an idea that’s a little different. BB is usually pretty good at whipping up some interesting stuff. 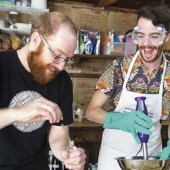 Why not have an episode where you make an actual soda ash soap and a DOS soap? There’s a niche market for everything. 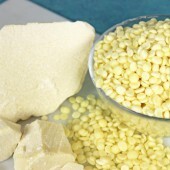 I want to see you make an all soda ash soap if you can, like pure soda ash to the very core of the soap. That’s the challenge of 2015! When is best to scrub your soap with nylons? When the soap is fully cured? Is it possible to overdo the alcohol? I sprayed several times on my last soap (my first column pour), and now the top looks a little mushy. The rest of the soap looks fine, so I’m wondering why the top looks so bad. I didn’t cover or anything and I soaped very cold (probably around 80 degrees). Any idea what happened? I know I’ll be able to fix it with my planing but I will have to remove more than I would like… Thank you! I’d love to help you out with this! What kind of alcohol did you use, and about how many times did you spray? How long has your soap been in the mold? What’s in your recipe? oh also I superfatted each at 8% Because I have extremely dry skin. I added ROE same amount each time to prevent rancidity with the short shelf life of hemp oil. I used all new fresh oils and ingredients. 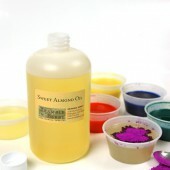 I also added the same amount of sodium lactate to each for the silicone molds. and I used distilled water for the tea which I let cool in the fridge before adding the lye. I made sure the lye was fully dissolved in the water and that the oils and lye were blended thoroughly. the first batch had lavender premium EO and colloidal oats with lavender tea subbed for water. the second batch (unsuccessful #1) had green tea for water, french green clay and geranium. (I was trying to do “green tea rose” but as you probably know the green tea turned the soap really dark. but when I first pulled it out if freezer it had lightened up and had little green speckles and I liked it.) It had partially gelled and once I took it out it began sweating little yellow oil layer on bottom and I’m pretty sure it finished gelling it’s so much darker now! the 3rd batch was perfectly not gelled when I took it out and now it’s dark too with what I think is partial gel (hard to tell with all this ugly ash) so I’m pretty sure it gelled too at least partially. So yeah then sweating happened which turned into ash on all sides when it dried and one ugly orange side from oil sweating I guess. Thanks so much for that recipe, that helps me out a lot! I have a couple ideas, but I have a few more questions! I ran your recipe through the Lye Calculator and got 2.11 oz. of lye and 5.28 oz. of liquid. Is that how much you used? Also, I’m going to link to a post about Dreaded Orange Spots, or DOS. Does your soap look like those pictures? No it’s not DOS- I’ve seen pictures of that a lot and it isn’t that. 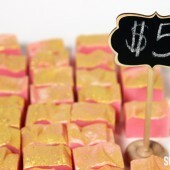 plus these soaps are less than a week old and this happened about 2 days after making them. and yes I used 2.11 oz lye (actually 2.10 Bc the scale I bought from brambleberry only measured to .05 oz so I could only do 2.10 or 2.15).but that’s what I did on the successful batch also which is doing really well. and I used 6 oz of water- MMS said 4-6 oz so I used the full water amount. their site says to use full water amount with sodium lactate and since it was my first 3 batches I didn’t want to use a water discount also before seeing what sodium lactate did on it’s own. literally the ONLY thing I did differently with the messed up batches was remove them from the freezer earlier and removed from mold immediately, instead of waiting. I haven’t read this matters too much but maybe it’s my palm free recipe? I honestly have no idea but it isn’t like any soda ash examples I’ve seen and it isn’t DOS. 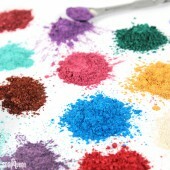 there aren’t any spots or orange spots or bad smell- they’re evenly colored and smell great. they’re just darker than when I first took them out and covered in what looks like soda ash. I guess ill just have to try again and do what I did the first time and hopefully this fixes it. None of them zap so I think they’re usable, just very ugly haha. I’m very happy with my first attempt at this recipe! and since I did everything else the same and I can’t seem to isolate any other possible factors, I will just have to test and see what happens. if nothing else at least I have advice for other people who may experience this since I can’t seem to find it anywhere online. I think I know what happened! When you remove something from the freezer and leave it at room temperature, you may notice that it forms condensation. This is the same thing that happens to soap! The frozen loaf is returning to room temperature and drawing in moisture. Please help me! 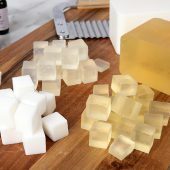 I’ve made 3 batches of soap – each with the exact same recipe and superfat level. The first batch I made in a silicone loaf, I prefer the look of none gelled soaps so I put it in the freezer overnight. I took it out in the morning and let it sit at room temp for a couple of hours, then unmolded. The soap turned out great although I got eager and cut it too early. the knife stuck and it’s a bit uneven, haha. but other than that it’s fine and curing nicely. So I made my second two batches back to back in your square individual silicone mold. I put them in the freezer. but this time I unmolded them immediately after removing them from the freezer. They were hard enough and looked beautiful and glossy upon unmolding and I loved the look of the non gel. I noticed a couple hours later they were covered in little droplets of oily sweat (it looked like your picures of “glycerin dew” except more yellow. but this isn’t m&p…) – the bottoms had this little layer of yellow oil that turned that side a little orange. This had me worried so I turned a fan on and directed it at the soaps on the rack. Today the soaps are covered in ash and they seem darker than before almost as if when I took them out of the fridge they started to gel on their own? So my question is what happened to my second two batches? Did I not leave them in the freezer long enough (i left the first successful batch in longer) and did unmolding them immediately after removing them from the freezer cause this oily sweat that dried into ash? should I do what I did the first time- leave it in the freezer for 24 hours take it out and leave at room temp for a few hours, and then unmold? and then they won’t sweat? have you ever heard of or experienced this? I hear about soda ash on tops of soaps before unmolding but never hear about sweating after unmolding before the ash develops. or having ash all over the soaps on every side. I sprayed with alcohol also before putting them in freezer just like I did with the first successful batch. my other question is can soaps begin to heat up and gel after un molding at room temp after being in the freezer for about 12 hours? and my last question is is my soap usable? Hmm, I’m a bit stumped by that! I have some questions if you don’t mind. What is in your recipe? What temperature did you soap at? Did you use the same fragrance for all three? Also, how long did you stick blend them for? My question is:what if you dont use soda ash at all,what will happen? I’m new to soaping, but luckily have made some (I think) very pretty bars of soap. The problem I’m having is not soda ash (yet) but fingerprints! I’ve worn gloves but they still leave marks. How can I a) prevent fingerprints and b) remove them if they happen? I’m sure there is the simplest answer. I just can’t figure it out. Thanks! Fingerprints can be pesky, but there are easy ways to prevent them! To prevent finger prints, place a piece of freezer paper in between your fingers and the bars. That will prevent any transfer and keep them nice and clean. What else can I do to remove the soda ash? If you’re getting soda ash in your bars, there are a couple of steps you can take to prevent it! 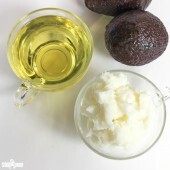 You can decrease the water amount in your recipe by 10% or work at a lower superfat level. Please help! I’m new at soap making and have been faced with this issue. 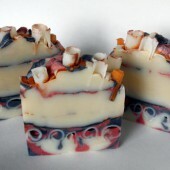 While my soaps are curing they sweat and when I rub the bars it smells horrible on my hands. It’s smells like a vinegar maybe ammonia smell. I don’t use any milks in my bars. Will this go away.the bars have already cured on average of 3-4 week and still are. Oh no! Do you mind if I ask what’s in your recipe? What fragrance and color? Also, how much lye liquid are you using? Good Article! Now I know I have a fight with soda ash on my soaps! I’ve been soaping for few years now and sell at local farmers markets here in Australia. I was at my wits end with soda ash. Every batch I made ended up with the dreaded ash. Needless to say I’ve tried many different techniques to prevent/remove it. Spraying with rubbing alcohol didn’t work. Soaping at all different temps didn’t work. Soaping with beeswax gave the soap feel and texture I wasn’t happy with and didn’t work. Covering with plastic wrap straight after pouring is only good for flat tops and also left wrinkle marks but it did work. Washing the bar also removes the ash but gave the bars a ‘used’ look. I texture my tops and have finally found a solution that works for me. Yay! After pouring I spritz the top with rubbing alcohol. I then gently cover with plastic wrap and press it around the edge of the silicon mould. 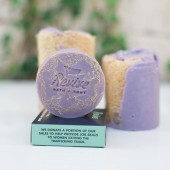 As the soap is hard there are no wrinkles or marks left on the soap from the wrap. It’s also not pressed firmly to the top of the soap but really only touches the tops of the textured peaks. Did/does steaming remove soda ash that was deep in the bar of soap, or just on the surface? 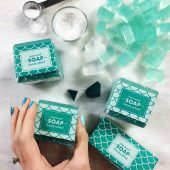 I struggle with soda ash on top and throughout my soap. So frustrating! 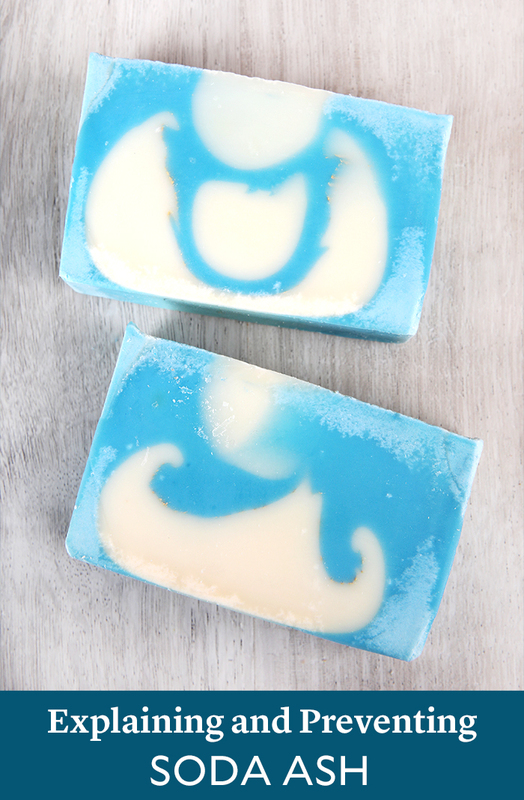 Typically, steaming works great for the top of the soap but may not get all the soda ash inside of the bar. 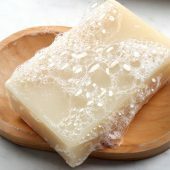 If your soap has been curing for a couple weeks or so and is fairly hard, you can use nylons to try and rub some of that soda ash off. Thank you for the response Kelsey. I am going to try some of those tips to see if I have better luck. And just so I am sure I understand correctly, once soda ash does get deep into the soap there’s no real good way to get rid of it, correct? 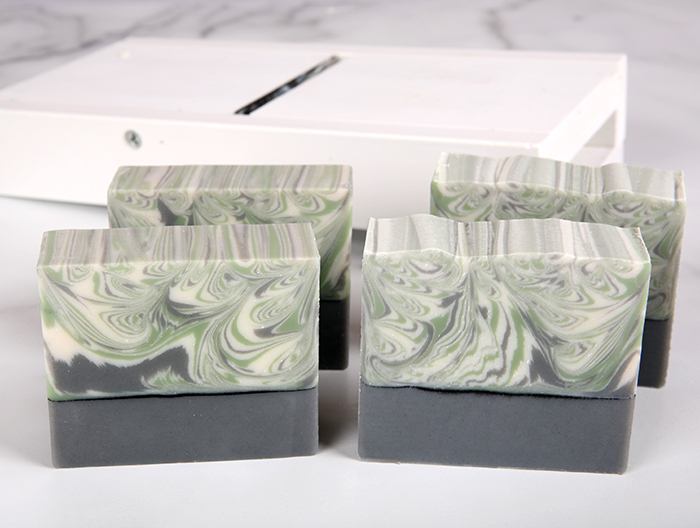 Can you steam over mica or sparkles or piped soap? How long to do hold the steamer in one place to prevent soda ash? 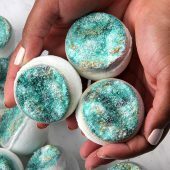 You can definitely steam over soap that has sparkles or mica on top, you can see us doing so in this Instagram video! 1. 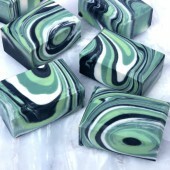 If I use mica previously mixed with oil in swirls on top of my soap. Should I put mica, sparkles etc… before spraying with alcohol or afterwards? 2. If I invest in a hand held steamer. Is it just a clothes steamer? Is there a certain brand that is better? When do I steam? Is it after cutting bars, 24 hours later, or longer? Sorry for the loaded questions, thanks for your help and time. 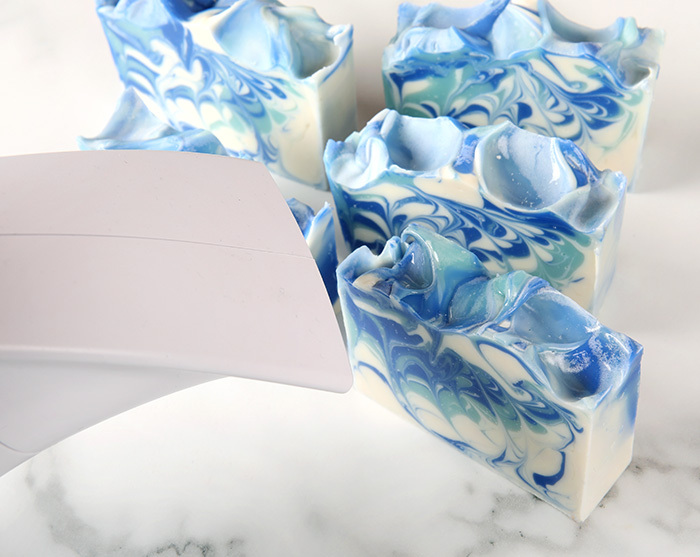 How soon after after pouring the soap in the mold can I use the steamer? 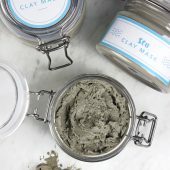 Can I use right away after ash develops or should I wait till after it cures? 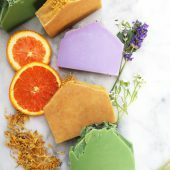 I’ve found that my soaps have little to no ash if I first spray with alcohol just after pouring, and second, apply a sheet of wax paper over the top of the soap (gently pressing to the top of the soap adheres to the wax paper) before I insulate. I’m still learning myself. I’ve had absolutely no luck with spraying with alcohol 10 to 20 minutes after pouring. However, I just tried spraying with alcohol 1 day after pouring when I first take the lid off of the mold. It works like a dream. The problem is the soap being exposed to the air for the first time. Spraying at that point dries the surface of the soap and soda ash does not develop. For what its worth, I was on the internet and found yet another “cure” for surface soda ash. It involves simply spraying the tops of your soap with alcohol, let it dry for about 10 minutes and then mist with water and let dry. Worked great for me, I hope it will be helpful to others as well! 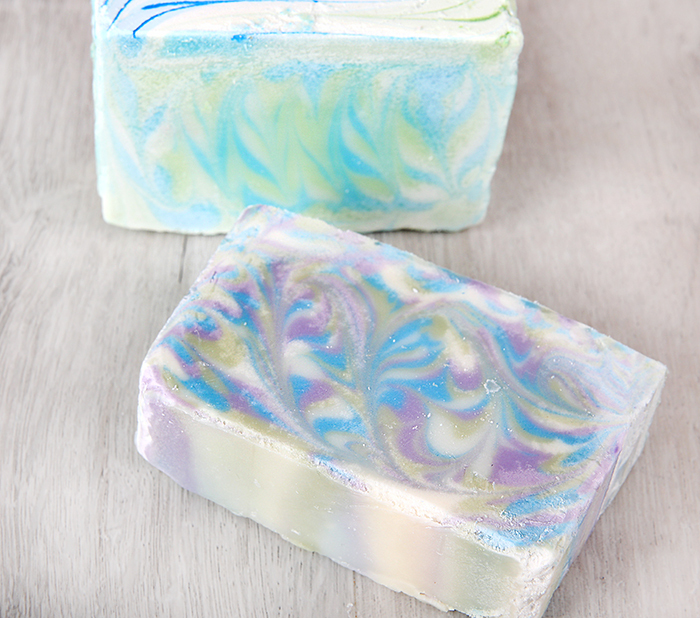 The rubbing alcohol actually dissipates as soon as the soap has dried, so it isn’t going to cause any dryness in the soap at all. I would try it out on a small test batch to see if you like how it works. 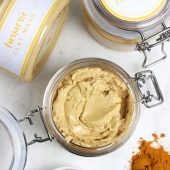 If you are finding that you are still getting soda ash, I would suggest adding a bit of beeswax (as listed above) and possibly investing in a steamer. When we’ve used the steamer it has really saved us so much time in the long run! Ok, I will try it next time and see how that works. I thought the soap would absorb the alcohol, but if it doesn’t, this might be a great solution for me. If not, there is always the steamer route. 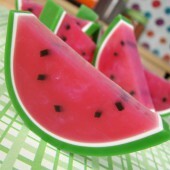 OMG I have just tried this and my soaps look AMAZING! I have made many flat bars with pretty swirls on them and was having to wipe them all with a cloth. I have a clothes steamer so thought I would give it a whirl. My soaps look shiny and new. I think the ashing has to do with the quality of the Sodium hydroxide and the reaction to oxygen. When I buy expensive NaOH this doesn’t happen. Having a light bulb moment here. A while back I bought a large roaster oven at Walmart on sale for $19.95 – one that has a temperature control gauge – so that I could follow Kevin Dunn’s single-oil soap testing instructions, using the roaster to CPOP them at 170 degrees. I just realized I could put a rectangular cookie rack inside with a silicone baking mat on top, then put water under it, turn it on and steam a lot of bars of soap all at once. The steamers I’ve seen run about $70, so this is a less expensive alternative. And now that I have bought very large (and very expensive!) silicone molds that will produce 68 bars of soap, I will need a way to “de-ash” a lot at once if I run into that problem. Pure Castile soap is notorious for being an ashy soap. I have found that spraying with alcohol and curing my soaps in a closet with a dehumidifier work well, I hardly ever have soda ash, no matter what my recipe or what FO/EO I use ~ it was $$ well spent! I found that the spraying with rubbing alcohol works great. 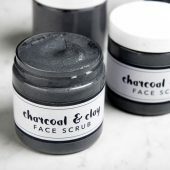 I mainly do CPOP soap and after I spray with the alcohol, I cover my large flat molds snugly with freezer wrap and have found this to greatly reduce the ash as well. Hi, After I pour my soap in the molds, I cover it with plastic wrap and then put a layer of thin styrofoam on top of that., Then of course my blankets and let it rest until it is coolded down.. I do not get any soda ash. It works for me. I actually learn to take water off the batch by mistake, and noticed that there was no ash! I just had to comment as I have only had ash once or twice in over 18 years of soap crafting; and that was when I first started. The only thing I have ever done to ensure a great batch is be absolutely meticulous in all my measurements and I always start at 87 degrees + or – 1-2 degree . I always make 35 bars at a time ; reasonably small batches for many. 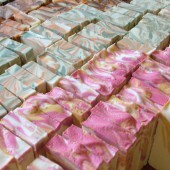 I occasionally made double batches of a popular soap but kept all measurements the same and mainly use essential oils. I keep fragrance oils to a minimum. I have no idea if all this is what keeps the bars clean ; but it works. I’m from N.Ca and presently live in N.W.Fl. and follow the same procedures every time. 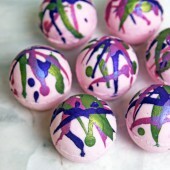 I seldom vary the recipe and do not get creative except for superfatting and colors. Great topic , thanks for the info. Hi Kallen … Is that 87 degrees fahrenheit or celsius? Thanks for the info about preventing ash. I’ve tried the alcohol and it doesn’t always seem to work. I often get ash inside the soap or else on the face within a day of unmoulding. It’s been very frustrating. Now I realise I may be soaping too cool. Thanks again. 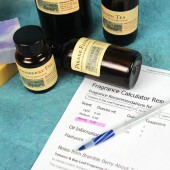 I agree with Jennifer that lavender EO is often a cult\prit–and it’s in a lot of my blends. 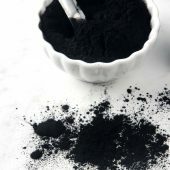 The worst ash ever was when I was experimenting with wine-based soaps. It was awful! Beeswax does help, but it has a melting point of about 145F/63C, so you have to soap hot to keep it from beading up in the final soap–and that won’t work for some EOs I use. It’s all a balancing game! 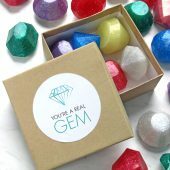 Thanks for these great ideas!I get soda ash every now and then. 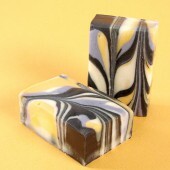 As I have just started selling my soap I’d love to remove the ash. I’m keen to try the nylons idea. Thanks for these great preventive tips. I’m a small batch soaper, and the last time I got ash I put the bars under a large mixing bowl with a cup of just boiled water. The bowl trapped the steam around the soap bars nicely. Most of the ash, gone. I recently read quickly dipping your cp soap in distilled water while wearing gloves (as Anne-Marie mentioned) will get rid of Soda Ash. As I like textured tops on my soap,this makes it a bit more difficult to “wipe” them with anything. Tried this method and found it worked for 2 out of the 3 batches of soap that had Soda Ash on them. I find that ash has a lot more to do with the EO/FO I’m using than anything else. 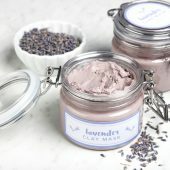 Lavender = tons of ash. Peppermint = almost none. I use the same base recipe for most all of my soaps, and generally soap at around 90-100 degrees. For me, its really really about the fragrance. Oh, I hate when the ash shows up in the bars! Argh! I find that spraying the ash on top of cured bars with alcohol and wiping off also works. And it dries faster than wiping off with water. I have found that just a quick rinse works without having to actually wipe off the top of the bars. Of course, always wear gloves to avoid the finger prints on your soap. All of my soap gets soda ash, no matter what temp I soap at, how thick the trace is, or even recipe variations. I’ve not figured out how to prevent it, although I keep planning to try spraying the tops with alcohol after molding, and always forget about it lol. Also, if I was to leave my soap in the mold even just over night, it would be entirely too hard to cut. Probably just a difference in elevation/temperature/climate since I live in west Texas. Thanks so much for all your tutorials, etc., I’ve learned so much from following Soap Queen! Wow! I learn something new every time I’m here. I have Never heard of the stocking trick! Thanks so much for letting us in on your tips! I had a bit of soda ash on my Simple Carrot Bars. Saw this tried it out and voilà perfect shiny bars. Thank goodness investing in a steamer a longtime ago. I didn’t even know this was possible.